NovaFusion - *We are first! is it faster than kitkat? One side is what Googla says, other side is what is a reality on the real phone. Novafusion YOU ARE THE BEST! We dont need aroma , please , give it to us !! Pues Viendo LA foto Y Compilacion Del Kernel Parece Ser Que Desde El 2 Ya Tenian Una Version Corriendo Supongo Que Estan Mejorando Fallos, Ojala Que Esta Sea Mas Estable Que La Kitkat. Oh my gods. I can’t believe it! You are amazing! Will you also make this for ace 2? Until release that “we are” should say “I am”. he said we are because two of them are working on it so, it’s right the he said we are. right? “WE ARE” as a community, not just them two. This rom run in art :D? can’t wait this on our phones. you’re really the best novateam. I love you guys you’re amaaazing! Keep up with the good stuff! Great work novafusion, are you going to include Lollipop for the S advance? Thanks for your time and hard work, God bless you Nova fusion Team. Does it work with the original S3, and where can I download the ROM? And you can’t download this rom anywhere for now. They have to make it stable enough for our phone first. yes Lollipop for S advance please ! !….Maclaw Team Rocks !! My phone “S Advance” is waiting for “5.0 Lollipop”. You made my day, парень!!! 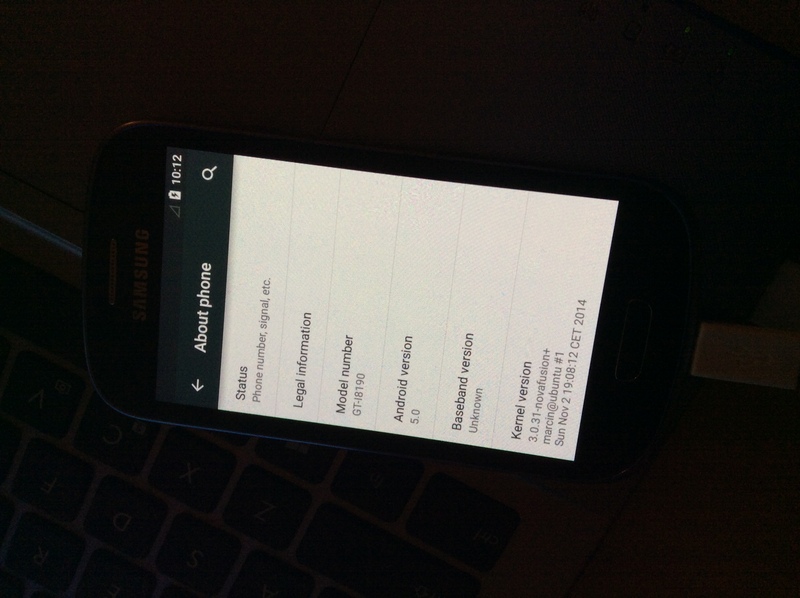 everyone on other sites are saying theyve just changed the build prop on another rom to look like its lollipop. android 5 isnt released to aosp yet so how can this be real. hope im wrong. any chance of a reply maclaw or marcin? You are wrong. Lollipop AOSP has been released on Nov. 3.
plus how do you know anyone is wrong are you part of nova team? No!!! you need to read first post “people on other sites were saying” does that say me or i? i hate people with atitude who hide behind posts but wouldnt say boo in real life, little nacker. i guesed that post would be moderated. Congratulations. It must be very exciting to do ROM development work these days for you guys 🙂 Stay positive and keep at it! Jaa..Thanks for your Hard work! I’m interesting… In this rom working all or not ? Sorry, for my english. Hopefully with the new update outstanding successes of the previous update are resolved and have enough other enhancements. I have a i8190N. Congratulations to the team. what makes it different than kitkat? ok so the source is now released so hopefully itll be soon, but still not printing my other post because it questioned if it was real, plus if you read it i said people on other sites where saying it. First of all, you’re wrond, second I can still see your “moderated” comments, and lastly I highly suggest to everyone else to stop feeding the troll. Thanks Novafusion! Has Lollipop 5.0 also the support for Italian language? When will this be available for download? It looks amazing! Don´t forget the s advance please! So.. is the asop lollipop same as this one? or is this Cyanogenmod lollipop? so many questions.. need answers please! This is AOSP. CyanogenMod team will wait a bit before they made CM12. Esto es mérito de NovaFusion, es la primera captura de pantalla de Android 5, tomada desde un dispositivo no compatible, Gracias NovaFusion, esperamos unirnos a uds, gracias por su compromiso !!! I installed this ROM, and it’s working great, but I also downloaded the gapps for Android 5.0. Everytime I do try to login with my Gmail it force closes and takes me back to the bezinning. Anyone knows why? its going to be………… LEGEN ( wait for it ) DARY!!!!!!! Clock freeze and 1GHz bug, right? When it will be ready for s3mini with cyanogenmod ? Can you give a date ? I’ve a problem, when i want to return on recovery mode?! Have an idea ? Can you please make this rom for s3 mini gt I8200? ?? Have you been reading my comments on GT-i8200? Read my comments on 08012015 comment section. There are two fully develop ROMs for GT-i8200. NovaTeam does not work on GT-i8200 so don’t waste your time.